In the past few decades, there have been a lot of advances in surgery, and many of these advances have been the result of new technology available to assist surgeons. One major advancement that occurred in the 1990s was when doctors could use arthroscopy to perform joint surgery by making small holes with a drill instead of large open incisions used in traditional surgery. A decade later, laparoscopes were commonly being used to allow doctors to perform surgery on a patient’s abdominal cavity without making a large cut. A laparoscopic gall bladder procedure greatly reduces the recovery time and risks associated with the procedure as compared to the older methods. The next generation of surgical devices involved the use of robots to assist with delicate tasks, and there are now robots able to help perform a total hip replacement. Hip replacement surgery has become one of the most common surgical procedures in the United States, with hundreds of thousands of patients electing to undergo the procedure each year. The reason people are deciding to have a hip replacement, or even a bilateral (both hips) hip replacement, is because, over time, arthritis and related bone spurs can make it very difficult to walk or even stand. However, in the past, having a hip replacement operation meant having a large incision that would require a lot of time to heal. There were also problems getting a precise fit, so there were often failures and other problems. Today, a patient should be able to have a total hip replacement performed and then have a relatively short recovery and be able to get on with the rest of their life with the ability to walk much more easily. Surgeons are performing total hip replacements more often, and they are very skilled at the procedure on average. 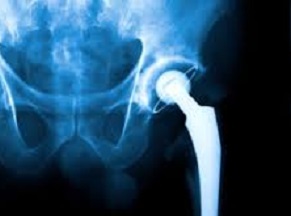 However, regardless of how skilled surgeon is, there is nothing he or she can do to prevent problems if a medical device company provides him or her with a defectively designed artificial hip. As our Boston hip replacement injury attorneys see on a regular basis, a defectively designed hip will often fail within a few years, causing tremendous pain and suffering to the patient. The only way to fix things is to have another surgery, and this requires another painful recovery period and more time away from family and work. It used to be that many hip replacement patients were retired, but with people having a total hip replacement at younger ages these days, combined with people working much later in life, were are seeing more lost wages claims incorporated into a defective hip lawsuit. As for this robotic device, the Daily Light is reporting the new device is called MAKOplasty. It uses a robotic arm to assist doctors with total hip replacement procedures and some knee reconstructions, such as resurfacing. The device incorporates advanced imaging technology to help doctors achieve a more precise fit when implanting the artificial hip. The more precision with which an implant is placed, the less likely it is to move laterally, which greatly reduces the chance of the implant failing.